Add instant high-end and traditional style with our Park Lane Oxford Mono Basin Mixer Tap and Bath-Shower Mixer Set. Whether you’re looking to spruce up your bathroom by changing a few key features, or if you’re completely renovating, these bathroom taps are ideal for bathrooms with a traditional style. Create a cohesive style that looks luxurious yet simple, by opting for matching bath and basin taps. Our Oxford Mono basin tap combines traditional style with modern technology, using a single spout to combine hot and cold water flow for your perfect temperature. Stylish, sleek and simple, the mixer tap is made from solid brass with a chrome plated outer. This ensures maximum durability while not compromising on style. The taps feature a high gloss shine that will not rust or go dull over time, due to the premium chrome used. The solid brass inner ensures that the taps are made to last, so that you can enjoy stylish taps that are also efficient for a long time to come. Ideal for use with all types of plumbing, the taps are simple to instal and are a great way of adding instant traditional and high-end style. 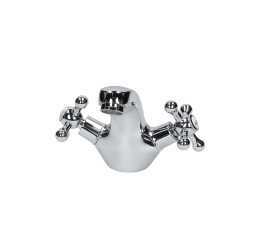 Add a little luxury to your bath tub with the Park Lane Oxford Mono Bath-Shower Mixer. Matching the basin taps perfectly, this set is idea if you have a shower over the bath and want to create a high-end style in your bathroom. Glamorous, stylish and traditional, this mixer is perfect if you love to switch between bath and shower. We’ve taken traditional style and updated it with modern technology, to create a great bathing and showering experience each and every time. Using ceramic disc cartridges, we enable you to find your perfect temperature with ease. Benefit from a smooth motion every time you use the stunning cross-head handles. Made from solid brass on the inner, with a premium chrome plating on the outer, this bath-shower mixer is made to last and will look amazing for years to come. Add a little luxury traditional style to your bathroom, with our Park Lane Oxford Mono Basin Mixer Tap and Bath-Shower Mixer Set.